The Election Commission has set up over 32, 815 polling stations across the state to accommodate a total of 280,747,22 people out of which 1,41,56,182 are men and 1,39,05,811 are women. The stage is all set for the assembly elections for 119 seats in Telangana as over 2.8 crore people will elect a new Assembly in the state. Congress joins hands with N Chandrababu Naidu-led Telugu Desam Party to form an alliance while Telangana Rashtra Samithi is allied with AIMIM. Bharatiya Janata Party is fighting the battle alone. The elections will decide the fate of 1821 candidates. Polling began from 7 am and will conclude at 5 pm. However, in some constituencies affected by Naxals, the polling will end at 4 pm. The Election Commission has banned the exit polls till 5:30 PM. 56.17% voter turnout recorded till 3 PM in Telangana. In a message to voters of Telangana, UPA chairperson Sonia Gandhi urged everyone to cast their vote and make the right decision. She said that their votes are not only for the future of Telangana but also for their own future. She said that the alliance between the alliance between Congress, TDP, TJS and CPI is their voice and is for each and every section of Telangana. She added that the people in Telangana have been betrayed by 'those in power in Hyderabad'. She then urged voters to make the right decision while voting. A message to the people of Telangana from UPA Chairperson Smt. Sonia Gandhi. "I checked my name online 2-3 weeks ago, my mother's and my names were there, my father's and my sister's were missing. Today we went to cast vote but my name was also missing. I don't understand how's my name missing. I've been living here for 12 yrs." Jwala Gutta told ANI. A man was taken into custody and charged under section 188 (Disobedience to order duly promulgated by public servant) of the Indian Penal Code for taking a selfie inside a polling booth in Rajendra Nagar in Hyderabad. A complaint was lodged by an election official following which the police took him into custody, reports PTI. "Use of mobile phone within the polling station is prohibited. He took a selfie inside the polling station and has been taken into custody," Deputy Commissioner of Police (Shamshabad Zone) N Prakash Reddy was quoted as saying by PTI. Telangana chief minister K Chandrasekhar Rao cast his vote on Friday at a polling station in Siddipet. the incumbent chief minister of India's newest state is confident that his party, Telangana Rashtra Samithi will win the election and will be in power for another term. Challa Vamshi Chand Reddy, Congress candidate from Kalwakurthy, Mahbubnagar was allegedly attacked by unknown miscreants earlier today. He was later shifted to Nizam's Institute of Medical Sciences (NIMS) Hospital, Hyderabad and is out of danger now. "I am hopeful. I am fully confident that we will be successful in every seat. 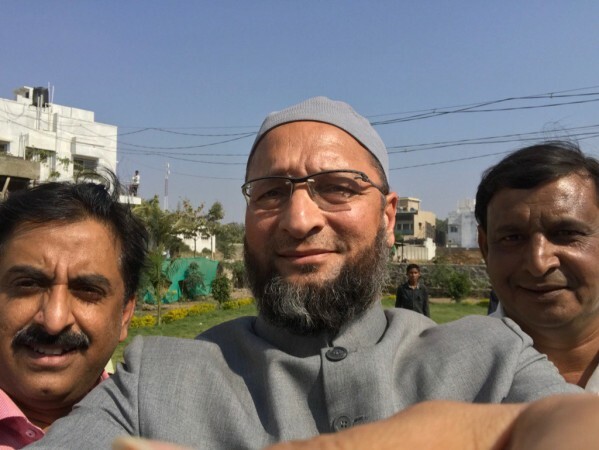 I hope people of Hyderabad, people of Telangana take this little difficulty, go out of homes and use their vote," Owaisi told reporters in Hyderabad. Earlier Oawisi had said the non-Congress and non-BJP parties should come to power after the Lok Sabha elections claiming that there is no diversity in the two parties. He said, "That's why I am of the opinion that this pluralism, diversity has to be reflected by regional parties coming together. Definitely,I am of the opinion that this country deserves a non-Congress, non-BJP government." Telangana recorded 49.15 percent voter turnout till 1 PM on Friday. The polling will continue till 5 PM. However, 13 constituencies will close polling by 4 PM due Naxal activities in the region. Telangana chief minister and TRS leader K Chandrasekhar Rao is confident that his party will retain power and he will come back as the CM for another term. "People are pro-incumbency. You will come to know by the evening when exit polls will be out," the chief minister was quoted as saying by IANS. Over Rs 3.50 crore in cash meant for voters was seized from a van in Warangal on December 6. The Telangana police said that the cash was supposed to go to a few political leaders who would distribute it to voters. the police was alerted of the van's movements and its contents on a tip-off. Total voter turnout in Telangana till 11 PM has been recorded at 23 percent. Jagityal had recorded highest voting at 12 percent while Nagarkurnool was the lowest at 6.7 percent. Danam Nagender, former minister and TRS candidate from Khairatabad came to the Indiranagar polling booth wearing a pink scarf, his party colour. A BJP worker criticised this act, drawing the ire of TRS workers and was then beaten up. BJP candidate, Ramachandra Reddy, has lodged a complaint with the Election Commission. #TelanganaElections #PWDVolunteers Helping at polling stations.#PWDVolunteers are ready to help you at polling stations. Telangana police on December 6, warned Rohingya voters to obtain genuine voter ID cards. Those who have obtained fake ones illegally would be immediately arrested. "If any Rohingya is found to have obtained EPIC and turns up at the polling booth on December 7, we will arrest that person without any hesitation," Hyderabad Police Commissioner Anjani Kumar was quoted as saying by PTI. GHMC has said that at least 105 Rohingyas have obtained voter IDs by falsely declaring that they are citizens of the country. Over one lakh security personnel have been deployed to ensure the safety of the voters. Among the one lakh, 25,000 of them are paramilitary forces, says Additional Director General (Law and Order) Jitender. Actors Chiranjeevi, Allu Arjun cast their votes in Jubilee Hills on Friday. Badminton player Jwala Gutta took to Twitter to announce that her name is not in the voter's list after checking online. AIMIM leader Asaduddin Oawisi casts his vote at Mailardevpally, Shastripuram in Hyderabad. On Thursday, he predicted TRS to win the elections but said that the AIMIM will not join the KCR-led party to form the government. EVMs not working despite replacement at two booths in AV College polling centre in Hyderabad. At 10 am, the polling has not yet begun. According to Times of India, Malakpet has a voter turnout of 11 percent, Amberpet with 5 percent, Jubilee Hills 8 percent, Sanat Nagar has had 10 percent, Karwan, 10 percent, Charminar, 4 percent, Chandrayanagutta with 7.5 percent, Yakatpura has a 4 percent voter turnout, Bahadurpura has 8 percent till 9:50 pm , Secunderabad with 8%, and Secunderabad Cantonment has 8.6%. Congress leaders asked party workers to monitor the electronic voting machines (EVMs) which were brought in as a replacement for the malfunctioning ones. Why is Telangana going into early elections? 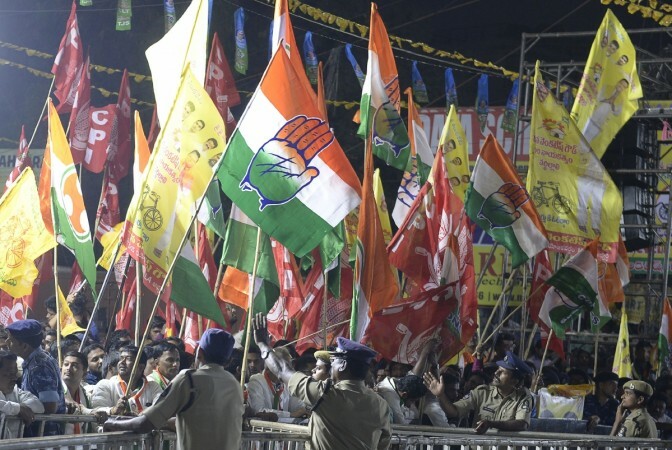 The Assembly elections in Telangana was supposed to be held simultaneously with the Lok Sabha elections in the summer of 2019. However, the state's assembly was suddenly dissolved in September which called for the state to go for early elections.